Former European Ryder Cup captain Bernard Gallacher has launched a nationwide campaign which could potentially help to save the lives of golfers of all abilities and ages. Drawing on his own personal experience of suffering a sudden cardiac arrest on August 28, the 1995 winning captain was joined by a gallery of friends and colleagues from the world of sport and showbusiness at Wentworth Club to activate the Bernard Gallacher Defibrillator Campaign 2014. It was only thanks to the availability of an automated external defibrillator (AED) following his collapse during a dinner reception in Aberdeen, along with early-response CPR treatment at the venue, that Gallacher was able to regain consciousness and take steps towards a full recovery. However, that close brush with death inspired Bernard and his wife, Lesley, to announce plans to lead a campaign for AEDs to be widely available in every single golf club and driving range in the United Kingdom and Ireland. With the Gallachers’ profile and encouragement, allied to a fundraising campaign being run concurrently with the PGA and Arrhythmia Alliance – the Heart Rhythm Charity - an estimated 2600 golfing venues and around 4,000,000 club golfers could benefit from the Campaign. 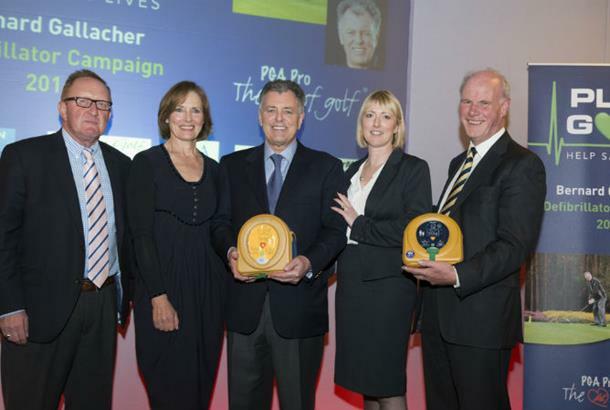 Gallacher, who was speaking at the Campaign launch in the Ballroom of the clubhouse where he spent over 20 years as a Club Professional, said: “I consider myself incredibly fortunate that a defibrillator was on hand in Aberdeen to resuscitate me following my sudden cardiac arrest. But for that AED and the quick-thinking, expertise and life-saving skills of the medical personnel in the room that night, I wouldn’t be here today. “Without early intervention, an individual has just a 5% chance of surviving a sudden cardiac arrest, so Lesley and I felt it appropriate to try to ensure others are equally fortunate should they collapse in or around a golfing venue in future. 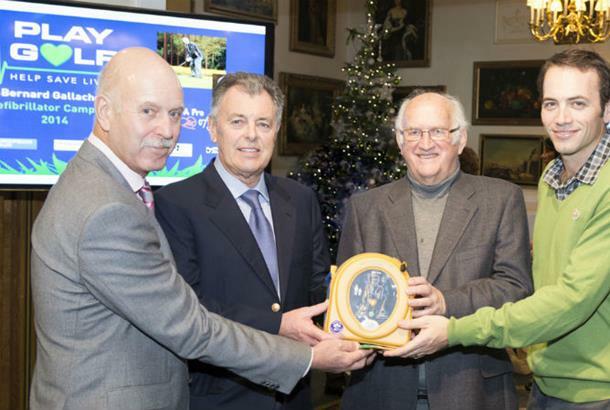 “Currently, just 30% of golf clubs have a defibrillator and our stated aim is to try to raise awareness of the importance of having an AED close by in case of emergency, and to increase that figure considerably by encouraging every club or driving range in the UK and Ireland to have at least one public-access defibrillator by the end of 2014. Trudie Lobban MBE, Founder and CEO of Arrhythmia Alliance, said: “Bernard’s experience has shown the life-saving difference of early CPR and use of a defibrillator. We are delighted to join him and the PGA in this campaign for every golf club in the UK and Ireland to have their own device. Sandy Jones, Chief Executive of the PGA, added: “The PGA is delighted to join with Bernard in this campaign to install defibrillators in every golf club in Great Britain and Ireland. It has been a long standing ambition of my own and the PGA that this should happen, and as we have seen through the near tragic experience of Bernard, it is vital that such equipment is available at the time of need.